Second, Melissa ensures she’s always trying something new by tracking all her cooking in an ever-evolving magical recipe spreadsheet. In the spreadsheet, she also keeps notes on dietary restrictions, time spent, ingredients, and tweaks she’d make. As a person who loves her spreadsheets, I had to know more. (P.S. Yes, you will get a chance to see this spreadsheet). When Melissa moved to DC 7 years ago, it was her first opportunity to cook for herself, and at that point, she was just “trying to find recipes that fit my grad student budget and that I wouldn’t mess up.” Originally, she saved recipes she liked in a Word document, and enjoyed keeping notes on what worked. She found she truly enjoyed reading food blogs and planning her meals for the week. (Scroll down for links to Melissa’s favorite recipe resources). 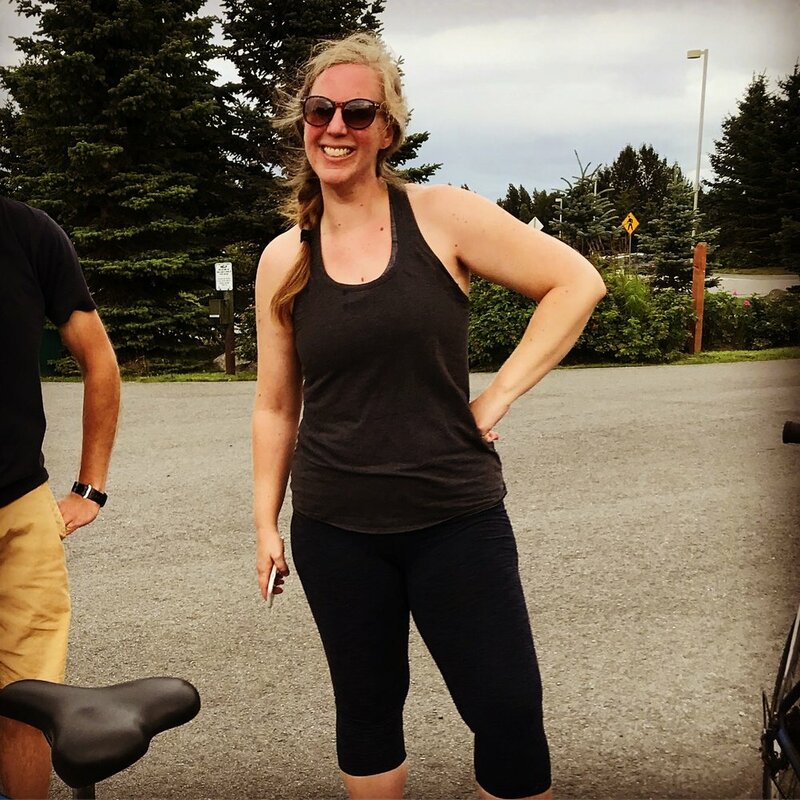 “I always aspired to more seasonal eating because I was aware of the environmental impact of what I was eating, but being on a budget made it hard to integrate into my diet,” says Melissa. She got her feet wet with a CSA that dropped boxes at her workplace before finding her way to Owl’s Nest. Today, Melissa is a self-described “huge CSA nerd.” Not only does she use ALL her share each week (as in, she brought pickled chard stems to that CSA member potluck), she and Dave have volunteered regularly on the farm over the years. How does she make time for this delicious life? For one, she really likes it: she doesn't just enjoy eating, she also enjoys reading food blogs, planning meals, and spending time in her kitchen. Then, Melissa and Dave spend weekend hours on culinary adventures, trying more elaborate recipes, like this Ratatouille Pie, Julia Child's Zucchini Tian, and Marinated Summer Squash with Hazelnuts and Ricotta. Read on to learn more from Melissa, and even get a peek at that epic spreadsheet. Thug Kitchen has straightforward but sassy vegan recipes. 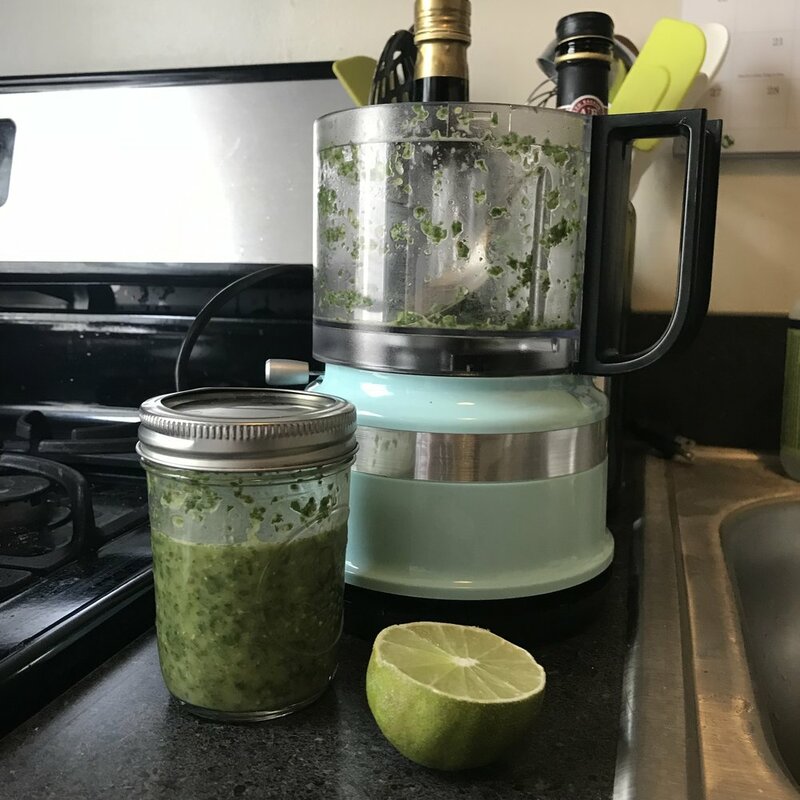 For Melissa, a food processor is key, because she makes a lot of creative pestos and for when, she says, "I’m tired of chopping." She also loves her micro plane, especially for grating ginger and garlic. Finally, Melissa extra loves her ice cream maker! It's a standard 2 qt from Cuisinart and she says: "I have made some pretty wacky flavors--carrot halvah, huckleberry tea, I even made basil ice cream for my coworkers (they preferred the chocolate stout ice cream I also brought, unsurprisingly)." Melissa was kind and generous enough to share her magical spreadsheet, and there are a ton of recipes. Don't miss out on the "Best of CSA" and "quick snacks" tabs - lots of useful stuff there! Maya moved into a group house in Columbia Heights five years ago, and at the time, she admits she was still learning how to cook. She had some solid staples she'd used since college, but when she moved in with her four housemates, she was still getting used to cooking with fresh produce. Luckily, she had a cooking community around her. "I ended up in a community of people, not just in my own house but in the other group houses in our broader community, and they would have house dinners all the time or potlucks so I just got exposed to different recipes and different ways to cook vegetables," says Maya. From a cabbage salad to a garlicky kale sauce, she got inspired by her neighbors to try new recipes and share them with her housemates. Her house, aka Rosemont, had a membership to the Radix Farm CSA (the predecessor of Owl's Nest) at the time, and she "got really into it" and especially into knowing who her farmers are. Although they loved the Radix CSA pickup at St. Stephens, after an infamous "daikon debacle" in which they tried way too hard to like those big radishes, they decided to shift to the Market CSA. This option allows Maya to plan an relaxing trip to the market most Saturday mornings to stock up on veggies for the week. The CSA has also helped orient her meal planning process around what's in season. "I’ve learned to let the crops drive the cooking," Maya says. "I have a couple of go-to recipes for each vegetable and whatever vegetable shows up determines what I cook for the week." Along the way, Maya also added her "farmer boyfriend" Jon to her cooking team, which has not only encouraged her to care more and more about where food comes from, but also made her enjoy cooking collaboratively. "I think Jon and I are really good at looking at what’s in the fridge and turning it into whatever we need, particularly seasonally. How can this become soup in the winter and how can we throw this on the grill in the summer?" says Maya. Another key part of their seasonal eating strategy is what Jon calls "the unsung heroes of cooking seasonally": the sauces. Among Jon and Maya's pantry staples are the ingredients for making a variety of delicious sauces that help make veggies into meals. Jon says: "Get the temperature and texture of the vegetables right and then the sauce is the separate delicious thing" to round it out. Scroll down for links to their favorite sauce recipes. Consistency: Maya likes that the upfront commitment requires that she picks up vegggies each week, because it means she'll actually do it. Connection: "It's really excellent to know who’s growing my food. I can support the people in my community and the people I care about by getting vegetables. I can look at you and ask you questions and know the hard work that went into growing something before I consume it," says Maya. 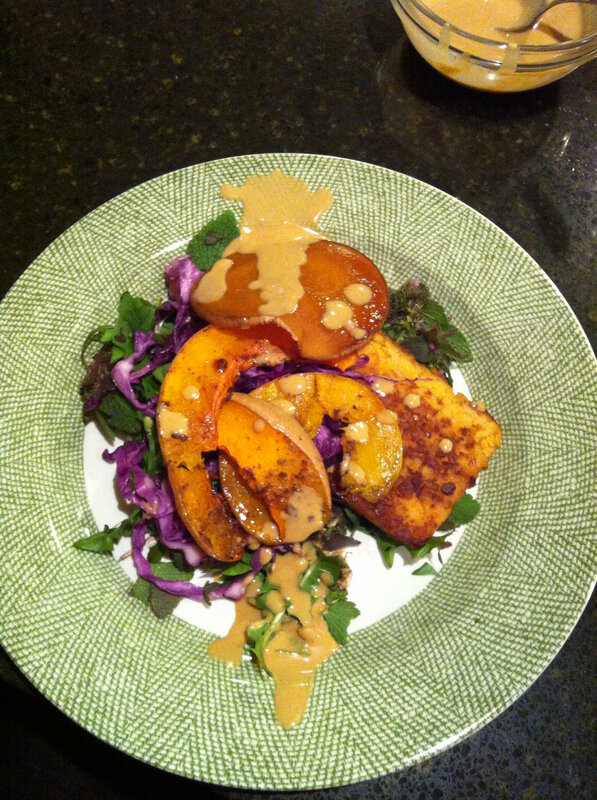 Miso-sesame dressing from Smitten Kitchen is great for roasted root vegetables and "just about everything." Garlicky kale sauce: just olive oil, ACV, nutritional yeast, lots of fresh garlic, soy sauce, and tahini (if you like it thick). "Put that on kale and you can crush a bowl of it," says Maya. Shoutout to neighbor Meredith for this one! Black garlic and yogurt sauce: This new addition to their repetoire is "so f--ing good I wish I had some right now." Maya notes you can stock up on black garlic at H Mart. Pesto: Maya has been making pesto from all kinds of greens for years. Any extra greens can be combined with olive oil, salt, nuts, and cheese for a delicious sauce. Staple foods: grains, rice farrow, pasta, black beans, chickpeas, tofu, tempeh, canned tomato, tomato paste, yogurt, lemon, limes, red onions, garlic, ginger, veg stock. Tools: Knives! "We just got sharp knives for the first time in our lives," says Jon. "And cooking is so much better now. I actually enjoy cutting onions." Maya also uses her immersion blender basically every time she cooks. Plus, their food processor, cast-iron pan and grill are essential. Smitten Kitchen - Maya especially gets inspired by their Instagram feed, where she can get excited about a new dish while she's scrolling. Simple by Yotam Ottolengi - While some of his other cookbooks are made up of complex recipes "with like 25 ingredients" this one is 'simple' enough for weeknight meals. New York Times Cooking email newsletter - although it's more meat-focused than their house is, Maya finds it useful sometimes. As a dietitian, Jenna approaches cooking and eating differently from most of us. "I’m not picking things based on what I’m craving. I’m thinking about how to I make sure I’m getting essential macro nutrients," says Jenna. That's why Jenna is all about eating vegetables for breakfast. That's right: nearly every morning, Jenna and her partner Julia cook breakfast from scratch using CSA veggies. "I get my vegetables in at breakfast and it means I am that much further in to getting enough vegetables for the day. It’s not fancy, but it’s cooked," says Jenna. (Not sure how many vegetables you should be eating each day? Jenna recommends this resource). My guess is you're thinking: That'll never work for me. I can barely eat my bowl of cereal before I rush out the door. For Jenna, it's something she prioritizes. While she recognizes it's not normal ("It's nearly impossible to find a healthy breakfast. It's not part of our breakfast culture to eat vegetables," she says), it's a "non-negotiable" part of her morning routine. Their breakfast almost always includes a grain, eggs from pasture-raised chickens, and a vegetable, like steamed sweet potatoes or sauteed greens. (Scroll down for more on Jenna and Julia's favorite breakfasts. Even if you're not up for cooking in the AM, you might love these recipes for brunch or dinner). Not only does a hot breakfast mean that Jenna gets an early start on veggie consumption, it also helps Jenna and Julia use all the veggies from their 3 different CSAs. I'll reiterate: Jenna and Julia are not only half-shareholders in the Owl's Nest CSA, they're also members of the Three Part Harmony Multi-Farm CSA and in the winter, they join the Open Book Farm Winter CSA. They're like 3-time CSA champions. 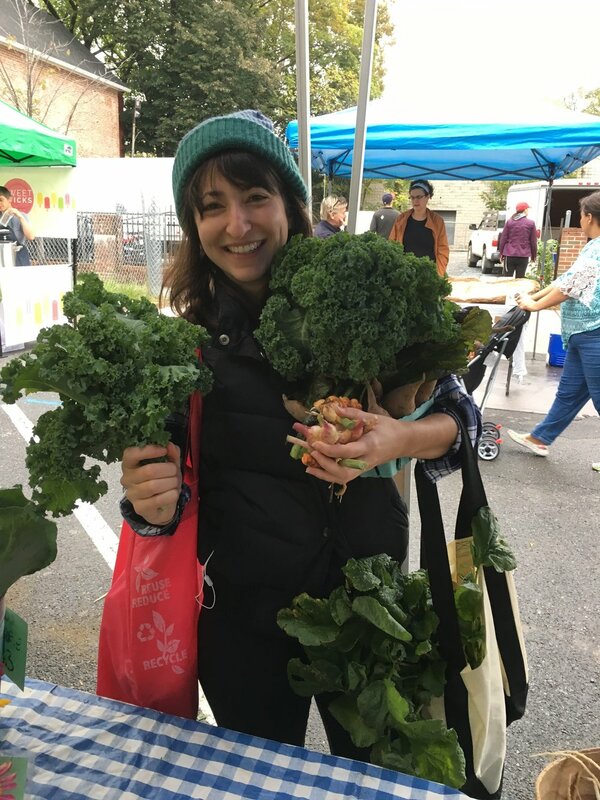 She "became enamored of farmers market" in Seattle when she was in grad school learning about the agricultural part of the food system. Through the vibrancy of local markets and eating fresh salmon of the Puget Sound, Jenna "learned to love and appreciate food that was eaten close to the source." That love and appreciation continues to fuel her interest in CSA today. "Make the vegetables to be the center of every meal." When meal planning, do an inventory of what you already have in the pantry. "You gotta have the supporting actors around so that when you get the star - the CSA veggies - you’re ready to make almost anything with them," says Jenna. They typically do weekend shopping with their Tuesday share in mind. Once you've got the basics in your pantry, keep it simple. "If [a recipe] has more than 2 ingredients I don’t have, I don’t make it," says Jenna. Speaking of simple, Jenna suggests honing in on a couple of versatile cooking methods. In her house, that means braising for greens and roasting for root vegetables. Batch cooking makes weeknights easier. "I’m not gonna cook from scratch every night of the week," says Jenna. On their best weeks, Jenna and Julia make larger batches of recipes, especially veggie sides, and eat them throughout the week. 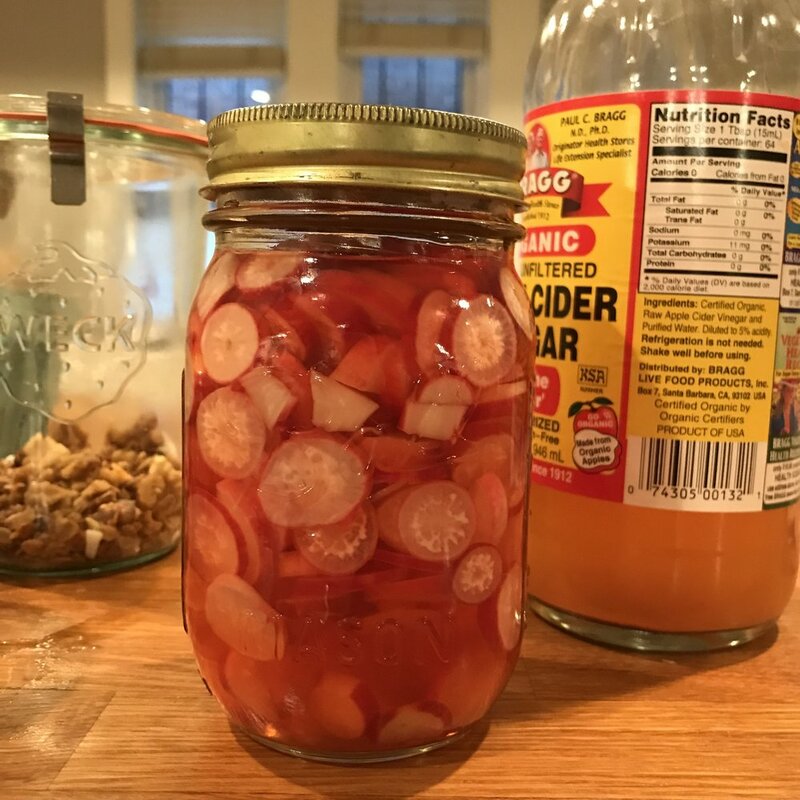 Read on to learn about how Jenna evaluates recipes and see what's in her pantry. I shy away from recipes that mention non-fat or low-fat products since this is typically an indication that the author may not share my emphasis on whole foods cooking. How many vegetables are featured? And in what portions? Does it amount to little more than a garnish or is it a major component of the dish? Tools: Cutting board, nice sharp chef’s knife, saute pan or cast iron skillet, good roasting pan (sturdy sheet pan or big glass dish). A special shout out to tools that do double duty. With tongs, you can move greens in a pan or lay a piece of meat on the grill. their Creuset pot is good for making stew or putting a casserole in the oven. Jenna uses a microplane or a grater a lot, especially to use up roots like beets, carrots, kohlrabi, turnips, and radishes. If you grate them the first time you use them, then stick them in the fridge, you can quickly top your sandwich, salad, or tacos. The picture is a mashup of two of our favorite breakfasts, says Julia. "Toast and and scrambled eggs appear on both plates. 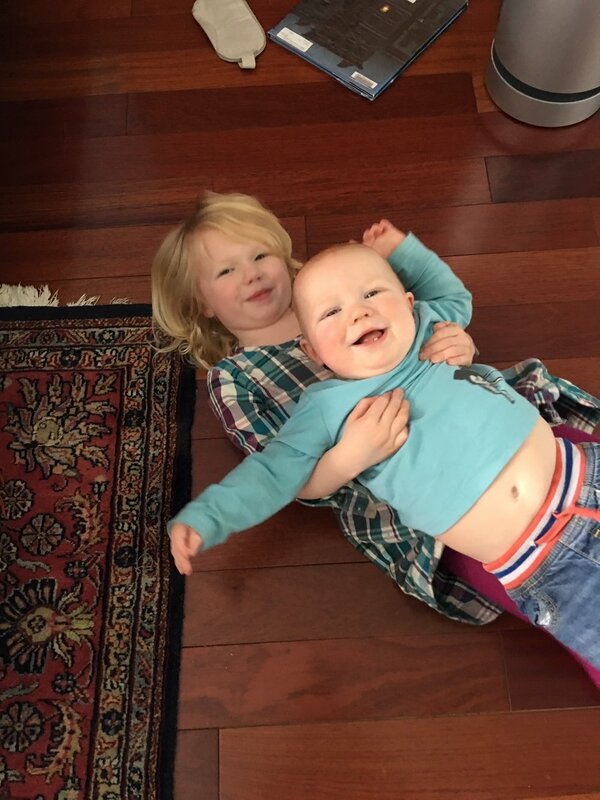 But on this particular day we weren't in the mood for the same thing, so Julia put together some salad greens for a quick light veggie, and Jenna braised some broccoli in oil and liquid aminos (a staple in our house)." According to Julia, another strategy for a quick but veggie-full breakfast is "jazzin' up leftovers. Just add another veggie, and put an egg on it." For example, the morning we talked, she started with leftover sweet potatoes and black beans, then added sauteed cabbage and an egg. Plus, here's some more inspiration for your next veggie-full breakfast. Julia notes these are a bit more complex than they might make on a weekday, but they give you a sense of how J + J start their day.